Being a typical lazy American, I never fully read the whole white binder that everyone gets with their Sunline. My stereo had quit working so I pulled the unit out from it's mounting (an easy 4 screws). I found a pair of RCA input jacks on the back of the unit, labeled Aux. Since my TV is right above the stereo, I plan on running audio output from the TV to these inputs, thereby routing the TV sound into the overhead speakers. When payday arrives, I'll make a run to Wally's World to buy a cord. Just a little mod that is cheap to do. You may want to take a closer look in the manual to check if they're actually auxillary RCA inputs or they're outputs . While I'm not familiar with your particular stereo, I'd imagine it's an RCA stereo output used on a lot of car stereos to run a non impedence 'line out' to an amp that would power other speakers or a bass unit. I replaced my trailer's stereo(AM/FM/cassette ) as soon as I bought it with a $100 JVC unit from wally world so I could play mp3 cds and have an 'in' jack for other components like a DVD player, TV, ipod, zune, or computer audio. I'd hoped the same for mine when I ran RCAs for the TV sound to the stereo unit but only found one set of RCA jacks in the back, an output. With my new unit, the only input is an 1/8" stereo jack on the front of the unit. They do make higher end stereo receiver's with rear RCA inputs, I just sorta doubt they'd have installed them as an OEM radio. My '99 has two sets of auxillary inputs via RCA jacks on the back of the unit; one for AUX and one for an add-on CD player. There is also a pair of RCA jacks for an output line as well. If memory serves, many of the AM/FM/Cassette or CD units made for the RV market do have extra inputs on them. We use the AUX input for either the TV or our XM satellite radio system. Works great and we get the sound at both ends of the trailer. Steve, thanks for the heads up, I guess I had my head in the sand about that line of specialty for stereo units. 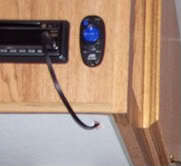 I've dealt with mostly car/truck/boat upgrades of audio and video, the RV specific components are a new branch for me. To be honest I never even looked at the OEM cassette deck(1992) for rear inputs before replacing it, I think because the only tape I still own is the 'Men At Work'-Business As Usual cassette. i think that we have the same stereo - if so, they are input jacks for the AUX ---- i cut a small hold in the counter top above the stereo (as my unit is a small corner unit entertainment centre) added a cable gromet and ran a 1.4" jack to RCA up through it ---- also put the DVD play underneath so that it was not in the way all the time. have a couple of sets of wire running through the gromet --- the AUX that i use of the ipod, plus the power and cable for the DVD play to hook to the TV and wall socket. it was an easy mod and one that we use all the time. i have been thinking of adding another shelf under the cabinet pull up raise the DVD player so that i can put a couple of small baskets on the shelf to use for shoes etc. Our '02 has an aux input, both on the front panel and the rear. We use the rear for a Sirius Satellite Tuner.